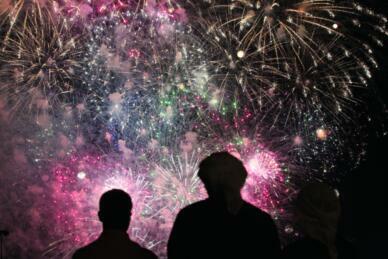 Patriotism and pride filled the air as Bahrain began celebrating its 47th National Day. A dazzling display of colourful fireworks set the tone as hundreds flocked to the celebrations at Bahrain International Circuit in Sakhir and a host of other places around the country, reported the Gulf Daily News, our sister publication. Among the attractions were musical concerts, heritage festivals, colourfully lit up streets, malls and landmarks as well as a wide variety of activities including children’s rides, food stalls and family friendly activities. The private sector, including malls, banks and major companies, along with well-to-do citizens and expats have pitched in to fund the decorations this year, said the GDN report. Fireworks, musical performances and family entertainment kicked off some of the biggest festivals taking place to celebrate National Day. Hundreds flocked to the celebrations yesterday taking place at the Bahrain International Circuit (BIC) which featured a wide range of activities including children’s rides, a traditional suq, food stalls and a musical concert by popular Iraqi artist Waleed Al Shami, said the GDN report. A spectacular fireworks display also lit up the Sakhir desert sky last night as part of the festival to mark Bahrain’s 47th National Day and the 19th anniversary of His Majesty King Hamad’s accession to the throne. The firework displays will continue at the BIC today and tomorrow at 7pm, along with concerts by renowned Saudi singer Rabeh Sager and Arab superstar Mohammed Abdu.